Another double challenge card! 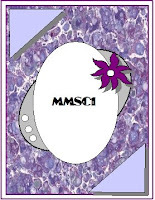 First I used today's CC over on SCS. The colors were Purely Pomegranate, Brilliant Blue and Only Orange, this was a hard combo for me! I also used a brand new sketch challenge called Midnight Madness Sketch Challenge, it was a fun one to use. I couldn't get the image to fit well in my ovals so I used my deckle rectangles instead, I also had to leave off the Big Flower/Embellishment cause I couldn't get it to work. 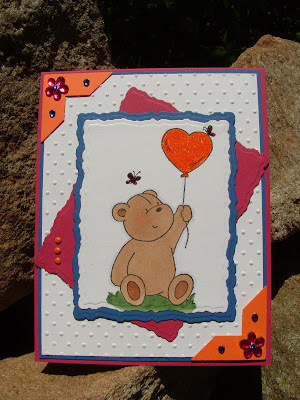 I used my Elzybell Teddy heart ballon, just LOVE their Teddy bear line of stamps! They have a new release coming out this week and the sneak peaks are adorable! You can see them on the Elzybell Blog. I got a quickie glue pen this past weekend and I LOVE it! Thats what I used to put the glitter on the ballon and butterflies , so easy! Cute Janice!!! Great job with both challenges!! Wow, I think I'd have a hard time with those colors too...but I LOVE what you did with them. The bear with the glittery balloons is very cute! !